It’s also been very illuminating to find that even when you can’t have grains, sugar or dairy, there is still A LOT that you can eat. Before this I honestly didn’t think it would be possible to go even a single day without bread or sugar or potatoes or cheese and now I barely give those things a second thought. I’m not going to lie: I rolled my eyes while reading how Whole30 would change my entire relationship with food. But now, a month and half later, there’s absolutely no denying that it has. 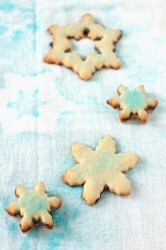 That said, I have a cookie recipe for you today, so it’s not like I’m going to completely stop eating the way I used to! I know I could if I really wanted to or if it was medically necessary, but the truth is that I still like bread and sugar and potatoes and cheese and I don’t want to give them up completely. Whole30 isn’t supposed to last more than a month. It’s a cleanse so that afterward you can reintroduce those foods and actually see how your body reacts to them and then you can decide what is and what isn’t right for you to eat. I’ve slowly reintroduced these things back into my diet and so far I haven’t have any major negative reactions. So what now? For the time being, I plan to keep following most of the major principles of Whole30 and Paleo. But since eating dairy doesn’t negatively affect me, I’ve been re-incorporating small amounts of dairy like yogurt and cheese back into my daily meals. 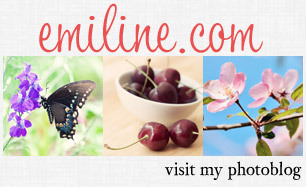 I’m basically following a form of Paleo called the Primal Blueprint. BUT one day a week I let myself “cheat.” This is mostly so I don’t have to give up eating at my favorite restaurants. It’s one thing to go a whole month without Mexican, Indian or Greek food, but not being able to eat my favorite foods ever again would just be too depressing to think about. This way I get a treat, while still eating well the rest of week and benefiting from that. I may not lose weight as fast, but that’s ok with me. I know from experience that denying myself or feeling guilty about eating “bad” food only leads to more unhealthy eating. Having a cheat day also means this blog won’t go totally Paleo or gluten free since I can still treat myself if there’s something I really want to make. Like these cookies! 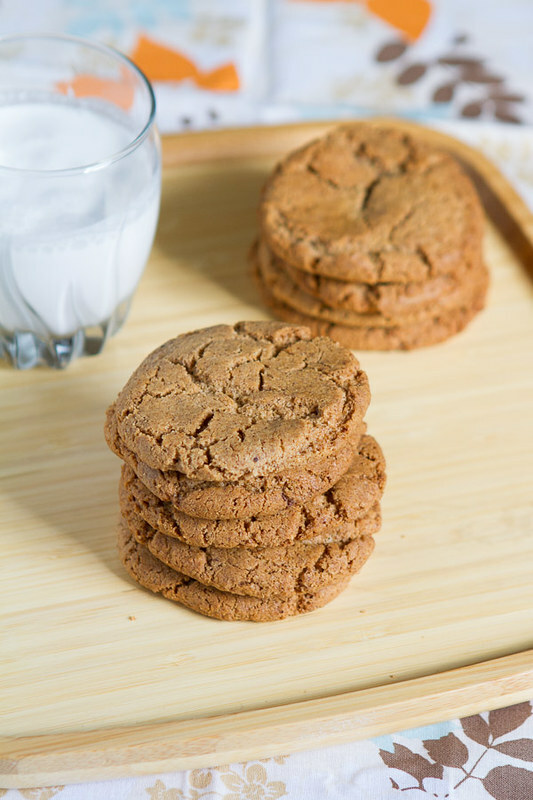 These cookies aren’t technically Paleo since they contain sugar, but they are grain-free and dairy-free. 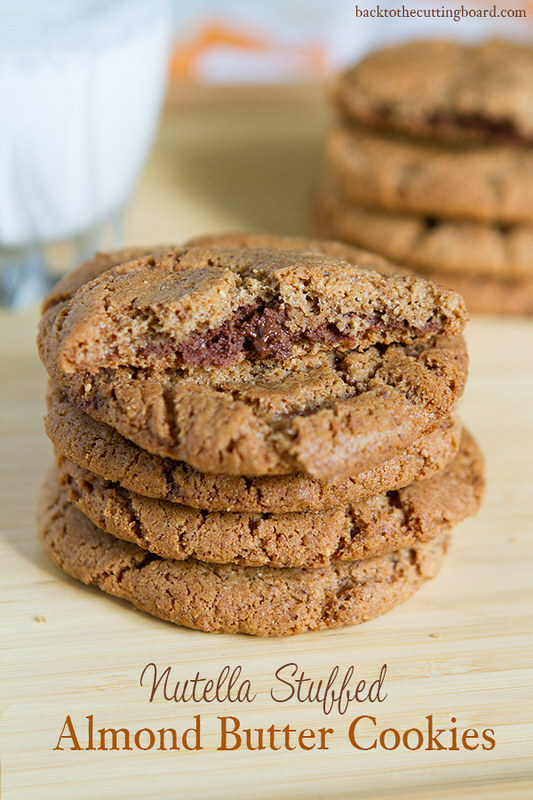 They’re inspired by my absolute favorite peanut butter cookie recipe but since I had to get rid of all my peanut butter I decided to try these with almond butter instead. I have an iffy relationship with almond butter. I really didn’t like it at first. I’ve gotten used to it now, but I don’t want to eat by the spoonful like I did with peanut butter (this is probably a good thing). But it turns out, if you mix almond butter with some sugar and few other ingredients and bake it into a cookie it’s delicious! 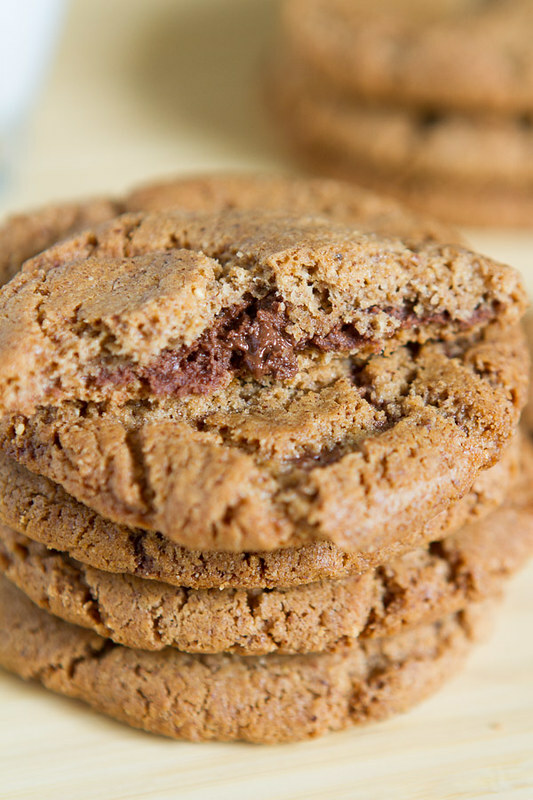 I had given up my precious nutella along with my peanut butter but then I found this natural, lower sugar Chocolate Hazelnut Butter at Target and that is something that I have to stop myself from eating by the spoonful so I knew it would be the perfect filling for these cookies. If you don’t have almond butter feel free to use peanut or whatever kind of nut or seed butter you prefer. To make these even faster, leave out the Nutella altogether and just stir in a handful of chocolate chips or cocoa nibs. I used unrefined sugars like cane sugar and maple sugar, but if don’t have those in your pantry, regular old white and brown sugar will work fine. These cookies could not be simpler to make. Seven ingredients. One bowl. No mixer. Easy to assemble. 13 minutes to bake. 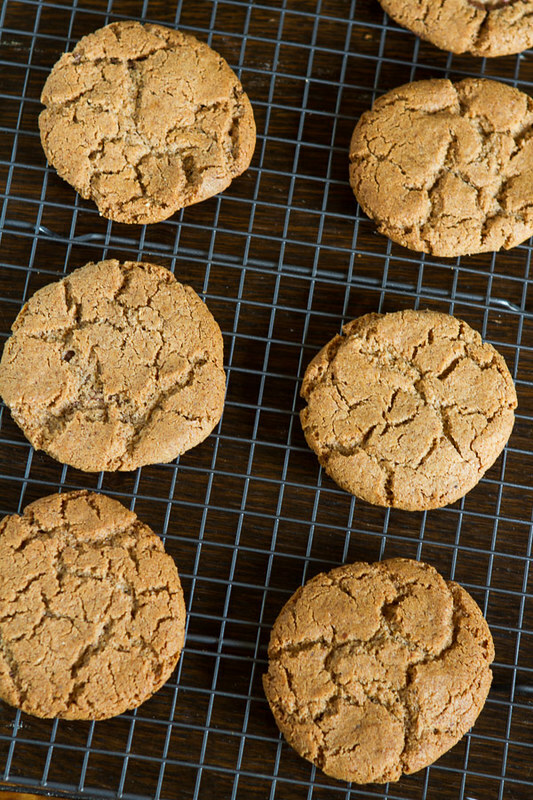 If you’re looking for quick and easy treat, you can’t go wrong with these almond butter cookies. Preheat oven to 350 degrees (F). Line two large baking sheets with parchment. 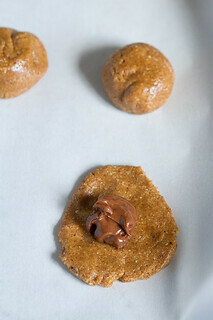 In a large bowl, stir together the almond butter, both sugars, egg, baking soda and salt until well blended. Scoop out a rounded tablespoon of cookie dough (I used a 1 1/2 tbsp. cookie scoop ), gently flatten the dough to about 1/4″ thick (be careful not to make it too thin or it will crack). Spoon 1 teaspoon of chocolate hazelnut spread in the middle. Gently fold the edges of the dough together and pinch closed, then (very) gently roll the whole thing into a ball. Repeat with remaining dough. Place 6 to 8 cookies per baking sheet, at least 2 inches apart (these will spread out a lot). Bake for 12 to 13 minutes or until puffed and the edges are just starting to brown. Cool on baking sheet for 5 minutes, then transfer to a wire rack. Serve warm or at room temperature. I used Justin’s natural, lower sugar Chocolate Hazelnut Butter instead of Nutella, but you can also make your own healthier nutella at home. YUM! Anything stuffed with Nutella has to be great. They look amazing! Congrats on finishing Whole30! Sounds like it was a great experience. I’m loving (and hating, for my thighs, you know) that this recipe only has seven ingredients. And I love all of them. I will definitely have to try this. Congratulations on your weight loss. You’ve made me curious about Whole30. Also, these cookies look lovely. 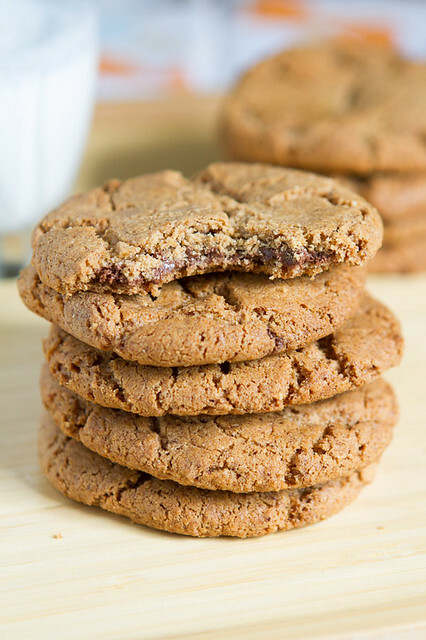 I love cookies that are easy to make. Thanks for the recipe. Just wanted to say congrats on the weight loss. It’s a long difficult road of dedication and lifestyle change but well worth it in the end! Good luck! So great to hear that your food programme have been working for you! I have been on the “Body 4 Life” program myself and know how well that cheat day is after a week of helthy foods. Chocolate have never tasted that good! The cookies looks good as well! Wow! These look absolutely amazing – I Love the whole chocolate hazelnut spread thing going on! Yay! Thanks for this amazing recipe!